At City Blossoms, organic gardening and environmental education meet art and community development. Founded in 2003 by Lola Bloom and Rebecca Lemos, this grassroots nonprofit builds gardens at local schools and recreation centers and uses gardening to build skills and healthy habits among kids. The City Blossoms model is unique: develop productive, organic green spaces where children and youth are the main cultivators, using gardening to teach about sustainability, health, responsibility, and artistic expression (alongside basics like writing and social skills). It doesn’t hurt if the project spruces up a formerly neglected urban lot, either – artistic expression and beautification are key pieces of the programming. Spanning seven years and at least eight different projects, City Blossoms’ activities reach more than 700 kids each week in D.C., Baltimore, and Langley Park. 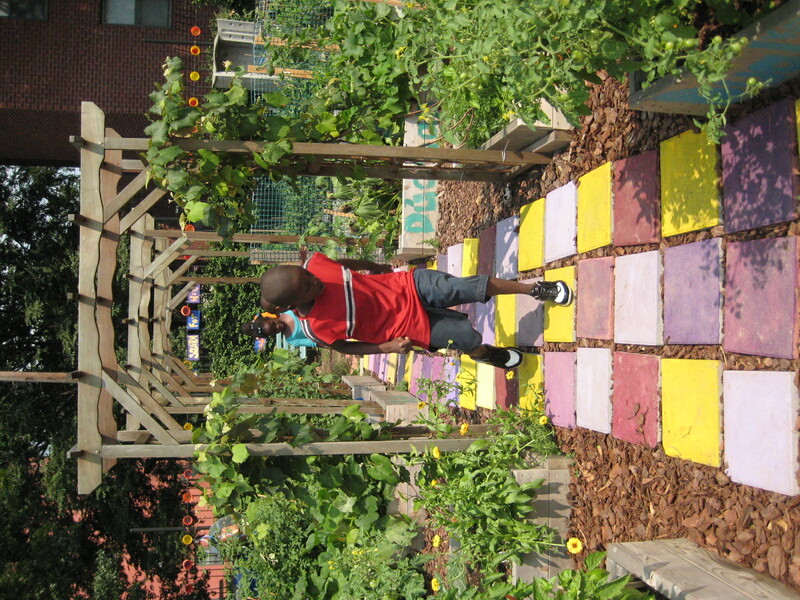 One of their success stories is the Girard Children’s Community Garden in Columbia Heights – in 2008, the group transformed an asphalt lot into a demonstration garden where children from community organizations now attend workshops and help grow vegetables, flowers, and herbs. The garden is also home to a free monthly workshop series for families. This season’s bilingual workshops kicks off on April 3 with a session on container gardening; future workshops this year will give kids and parents a hands-on opportunity to learn about herbs, insects, composting, and garden-inspired cooking. This spring, City Blossoms will be transforming another urban D.C. space into a neighborhood garden, this time on Marion Street in Shaw. The two lots will become home to drought-tolerant, native flowers and plants, along with herb and vegetable gardens, an outdoor classroom, and art spaces. On Saturday, April 10th, you can volunteer your digging and planting skills to help the Marion Street Community Garden become a reality. For the D.C. Bilingual Public Charter School and others, City Blossoms has also developed and delivered regular workshops tied to schools’ curricular goals and standards, hosted at the school, another local green space, or the Girard garden. And they create special school-wide events and after-school or summer activities that promote environmental and community stewardship.